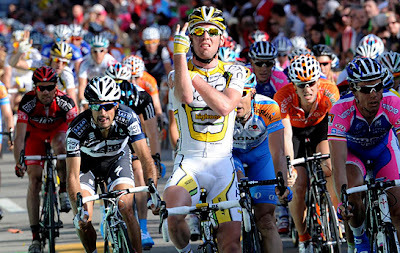 Pedalling Squares: Mark Cavendish: Britain's sweariest role model? 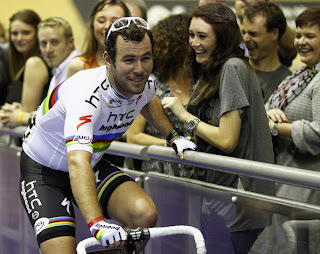 Mark Cavendish: Britain's sweariest role model? The shortlist for BBC Sports Personality of the Year 2011 has been announced, and it's making me quietly optimistic. For the second year running, Mark Cavendish is among the contenders, as are golfers Darren Clarke, Luke Donald and Rory McIlroy, cricketer Alastair Cook, athlete Mo Farah, athlete Dai Greene, boxer Amir Khan, tennis player Andy Murray and cricketer Andrew Strauss. This time last year I was exhorting people to “Vote Cav...in fact, vote Cav eight times, one for each Grand Tour stage win”. Sadly, it was to no avail. Capturing the Vuelta’s Green Jersey isn’t the same as capturing the public’s imagination with Tour De France successes, and for all that Cav’s 2010 TDF stage haul was impressive, I think it disappointed some people: they’re used to seeing him cross the line first, this time they wanted a jersey in Paris. To a cycling fan, it seemed almost inconceivable that Cav’s 2010 season didn’t deserve wider recognition, but when you looked at that year's shortlist it was hard to ignore the number of household names Cav was up against-Jessica Ennis, David Haye, Graeme Swann, Tom Daley and the eventual winner, Tony McCoy, a man who started dominating his sport back when Cav's bike still had spokie-dokies. This year, things look different. There are still plenty of household names in the list, but there isn't as much silverware amongst them. They’re all deserving candidates, but for the most part they’re either there for having had one or two high profile victories, or for leading the field in their chosen sport. Or for being Andy Murray. Mark Cavendish, on the other hand, ticks both boxes, having been consistently at the top of his profession for several years as well having had several stand-out wins this year. World Champion. Green Jersey. Two Giro stage wins, five Tour stage wins, a spell in the Maglia Rosa. Then there have been the victories that were less high-profile for cycling fans but arguably more important for the casual voter: winning the Olympic test event, winning the final stage of the Tour of Britain and getting started on a family with Peta Todd. British sporting life has long since left behind the days of loveable losers like Eddie Edwards and Tim Henman, and we’re getting quite used to being able to point at our athletes and call them the best in the world, but in Cavendish we’ve got something even better: short of a spectacular loss of form or terrible injury, he’s going to go down in the history books as the greatest sprinter of all time. On top of that, he’s articulate, emotionally honest, engaging and unfailingly polite about his teammates. He sets goals and works tirelessly towards them, and he delivers on his promises. He’s just about the sweariest man who could ever be described as a role model. That’s got to be worth half-a-dozen phone votes on December 22nd, surely? What's that, Mark? You want me to vote twice? OK!